Interactive Show, Interactive Show 2019 Comments Off on 2019 NYCResistor Interactive Show! We are happy to announce the date and theme of our annual Interactive show! This year’s theme is SOLARPUNK. Just what is Solarpunk? It’s a genre, it’s a movement, it’s an imagining of a brighter, greener, future where both technology and society are more humane. Check out TVtropes and https://solarpunks.net/ for a more detailed dive into what Solarpunk could mean. Also, like all Interactive Shows, we have an open call for artists and technologists to submit projects to exhibit. Submit a project using this form, this email ishow@nycresistor.com or join us on our public Slack for more details. The deadline for submissions is April 9th. And all through the hackerspace, not a creature was stirring, not even a mouse. No Craft Night on 12/24. Happy Holidays! Come to the Lipsync Buildathon At Craftnight! Uncategorized Comments Off on Come to the Lipsync Buildathon At Craftnight! Still in town for World Makerfaire? Come by NYCResistor’s Monday open night tonight and use you making skills to give back to the community! The LipSync enables a person that has no use of their hands to use a touchscreen device, laptop or computer — it is a mouth operated joystick that allows a person to control an onscreen cursor with minimal head and neck movement. An open-source hardware project funded by Google, it uses 3D printed parts, an Arduino Micro board, and other common parts that can be soldered to a circuit board and built in a day. A “Lipsync Buildathon” is an event that trains makers to build an open source assistive technology, the LipSync (www.makersmakingchange.com/lipsync). By the end of the session, each maker will make a LipSync for a person in their community. We’re kicking off this build-a-thon at 7PM in conjunction with our usual public open night, so come by and say hello! It’s time for another Interactive Show! This year’s theme is Self Driving Carbs. That’s not a typo right? No? OK let’s roll with it. It’s about some time for some smart digital comfort food. 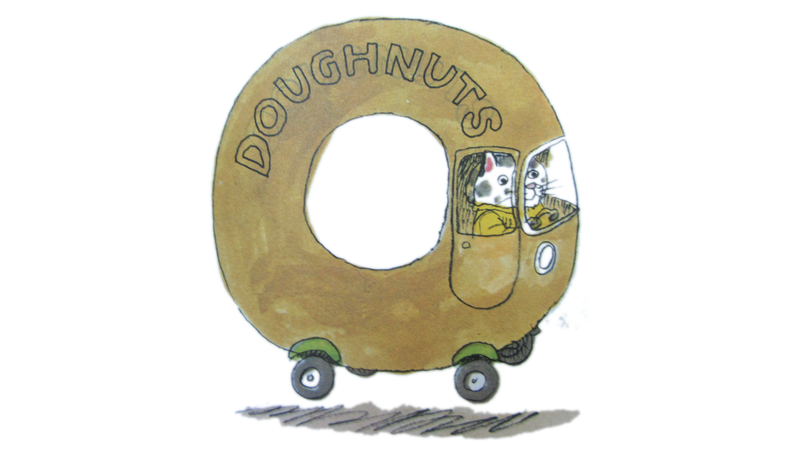 An Uber™ for doughnuts, a Facebook for foodies. Have those empty calories of content algorithmically delivered into you consciousness. So save the date for June 16th and drop us a line to submit your projects! Projects don’t necessarily have to be on theme, just something you want to show off at a party. I F*CKING love 8-Balls! They’re awesome little desktop oracles that make decisions easier. However, I thought their selection of phrases left a little to be desired, so I wanted to do a project to augment this timeless toy with a digital screen. But what could I get it to display? While putting together the project, the webcomic XKCD posted a comic with an emoji-8-Ball that generated random emoji combination in browser. Using a little bit of Canvas and the source from the original webcomic, I made my own emoji 8-ball fortune generator formatted for a tiny OLED screen fit inside an 8 ball. The screen has it’s own micro-controller and GPIO pins, which made it pretty simple to attach a tilt sensor (salvaged from an old Furby toy), as well as a battery pack that all fits inside a hemisphere of the original toy. When the ball is face-down, it randomly cycles though emoji pairs, and stops when it’s tilted up. I sliced open the original blue liquid container in the ball, and replaced the plastic window to make it look unmodified. The mysterious fortunes it provides are open to interpretation. The Emoji 8-Ball prop was build by Widget and debuted at NYCResistor’s 2015 Interactive show.